85 x 55 x 37 cm. Silkscreen under glass and wooden table. 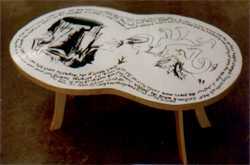 Bijzetafel (Side table or coffee table), is a silkscreen print under glass as part of a purpose-made table. 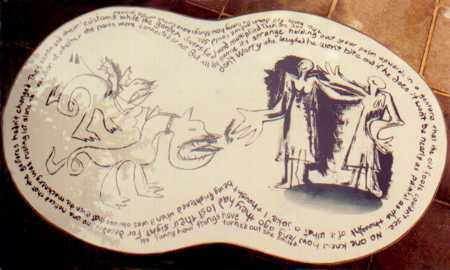 The print shows two laughing women, with one holding out her hand towards two dragon-dogs on leads. "he won't bite and if he does it won't be nearly as painful as the thought of it." "What a joke", I thought being frightened when it was obvious that even the machinery was rusting let alone the question of whether the parts were connected or not. But all the same it's strange holding out your palm upwards in a gesture that the old fools couldn't see. No one knew how long ago they had lost their sight. For decades no one had noticed that the gestures hadn't changed. They continued their customs while the garden diversified and multiplied. Then one day, the walls fell downand we could see. "It's funny how things have turned out," she grinned. Side Table | Bijzetafel, custom-made table with silkscreen print set into it.